Tikkas and kebabs are a treat for the non-vegetarians. Tikkas and kebabs can’t be resisted because of the spices and the tenderness of the meat. 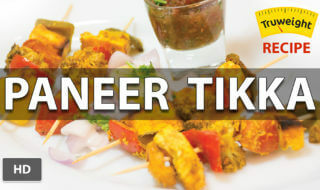 For non-vegetarians, this paneer tikka recipe can be served as a starter or as an accompaniment. This paneer recipe is hassle free and a delicious dish that everyone will enjoy. The yogurt and spices are marinated properly and baked in the oven. This recipe can be enjoyed as a snack/chaat or as a meal. In a bowl, add the spices, yogurt, ginger garlic paste, lemon juice, ajwain seeds, black salt, salt, and mix well. In the mixture, add the tomatoes, broccoli, paneer, onion, bell pepper and marinate it. Take a skewer and place the paneer and veggies alternatively on a skewer. Bake it in the oven and serve.